Signaling by the Wnt family of secreted glycoproteins through their receptors, the frizzled (Fz) family of seven-pass transmembrane proteins, is critical for numerous cell fate and tissue polarity decisions during development. We report a novel role of Wnt signaling in organogenesis using the formation of the islet during pancreatic development as a model tissue. We used the advantages of the zebrafish to visualize and document this process in living embryos and demonstrated that insulin-positive cells actively migrate to form an islet. We used morpholinos (MOs), sequence-specific translational inhibitors, and time-lapse imaging analysis to show that the Wnt-5 ligand and the Fz-2 receptor are required for proper insulin-cell migration in zebrafish. Histological analyses of islets in Wnt5a -/- mouse embryos showed that Wnt5a signaling is also critical for murine pancreatic insulin-cell migration. Our results implicate a conserved role of a Wnt5/Fz2 signaling pathway in islet formation during pancreatic development. 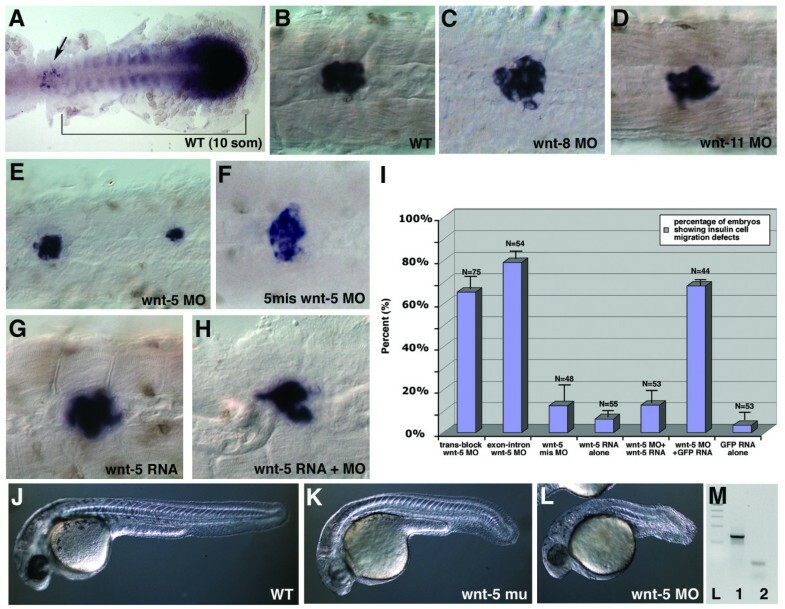 This study opens the door for further investigation into a role of Wnt signaling in vertebrate organ development and disease. Wnt signaling pathways play important roles in both normal development and in the pathogenesis of a variety of diseases, including cancer . Activation of a Wnt signaling pathway requires interaction between a secreted glycoprotein, Wnt, and a seven-pass transmembrane receptor protein, Frizzled (Fz). Different combinations of Wnt and Fz ligand-receptor pairs can transduce at least three distinct kinds of intracellular signaling pathways. The "canonical" Wnt signaling pathway (Wnt/β-catenin pathway) results in changes of intracellular β-catenin levels and is thought to be involved in cell fate specification and proliferation. Wnt pathway activation can also lead to changes in either intracellular Ca2+ concentration (Wnt/Ca2+ pathway) or actin cytoskeleton reorganization (Wnt/tissue polarity pathway) . The role(s) of these 'non-canonical' Wnt signaling pathway(s) in organ formation are largely unknown. A function for Wnt signaling has been suggested by the expression patterns of Wnt and Fz genes during development of the mouse embryonic pancreas . At embryonic day E11, Wnt5a and Fz-2 are expressed in the mesenchyme and epithelium of the pancreas. At E17.5, both Wnt5a and Fz-2 are co-localized with insulin- and glucagon-expressing cells. In contrast, only Wnt5a is expressed in the surrounding mesenchyme. In situ hybridization and RT-PCR gene expression analysis showed that both Wnt5a and Fz-2 are expressed in the embryonic pancreas from E11 until the end of gestation as well as postnatally. The highest level of expression is at E12 for Wnt5a, and at E12-E13 for Fz-2. 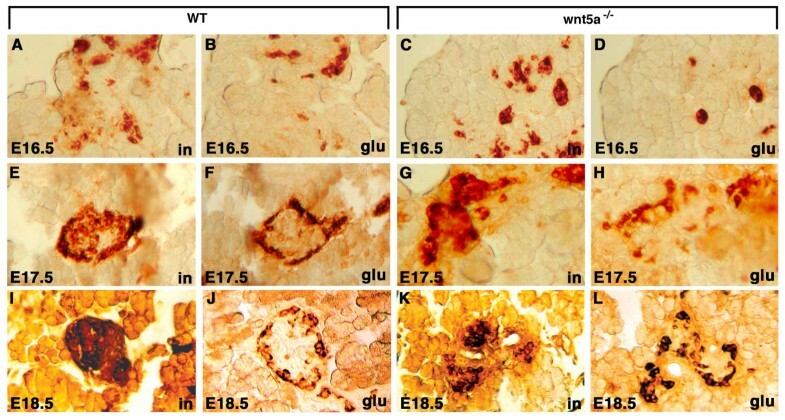 Overexpression of Wnt5a in the pancreas results in the formation of multiple small and scattered islets, but the mechanism for such abnormality has not been characterized . We explored a role of Wnt signaling in insulin-positive cell migration to form a pancreatic islet. In the mouse embryo at about E9.5, the primitive pancreatic epithelial cells express a transcription factor, pdx-1. Glucagon-positive cells are first detected around E10.5, and insulin-positive cells around E11.5 within the pancreatic ductal epithelium . At E15.5, clusters of intermingled insulin-positive and glucagon-positive cells are found in the pancreatic interstitium, largely associated with the ducts [4, 5]. During the last 4 days of gestation and postnatally, endocrine cells detach from the ducts, increase in number, and, at E17.5-E18.5, reorganize to form mature islets with the core of insulin-expressing cells surrounded by glucagon-expressing cells . Formation of mature islets is thought to require migration of endocrine cells out of the pancreatic ductal epithelium to the pancreatic mesenchyme. These processes are partially controlled by matrix metalloproteinases (MMPs), a family of enzymes that degrade extracellular matrix proteins . TGF-β signaling is necessary for the activation of MMP-2, which affects islet morphogenesis in vitro . Recently, it has been reported that EGF signaling also regulates activation of MMP-2 and affects insulin-positive cell migration . In mice lacking EGF-receptors, the majority of insulin-positive cells remain associated with pancreatic ducts in the newborn period. The zebrafish pancreas functions similarly to that of other vertebrates by secreting hormones and exocrine enzymes to regulate blood glucose level and participate in digestion, respectively [9, 10]. As in other vertebrates, synthesis and secretion of endocrine hormones in zebrafish occur in an islet called the Brockmann body, but unlike other vertebrates, only a single islet initially forms . Thus, the zebrafish islet provides a model for the simplest endocrine pancreas with the core biological complexity of other vertebrates. Insulin-positive cells are specified as bilateral patches around the 14-somite stage and subsequently form a single islet in the midline . Immunohistochemical studies using antibodies against insulin and glucagon revealed that the zebrafish islet consists of a core of insulin-expressing cells surrounded by glucagon-expressing cells, a structural organization similar to that observed in the mouse and the human [11, 12]. However, the pattern of cell migration and the molecular mechanisms of zebrafish islet morphogenesis have not been previously investigated. We characterized the process of insulin-positive cell migration in zebrafish and examined a role of Wnt signaling in pancreatic islet formation in zebrafish and the mouse. We show that wnt-5/fz-2 signaling is required for proper islet formation in zebrafish, and we demonstrate that Wnt5a signaling is required for the separation of islets from the ducts in the mouse. These phenotypes in zebrafish and mouse are consistent with defects in insulin-positive cell migration demonstrating a new and conserved role of Wnt signaling in vertebrate endocrine pancreas formation. To study the function of fz-2, we used morpholino-modified oligonucleotides (MOs) as sequence-specific translational inhibitors in zebrafish . 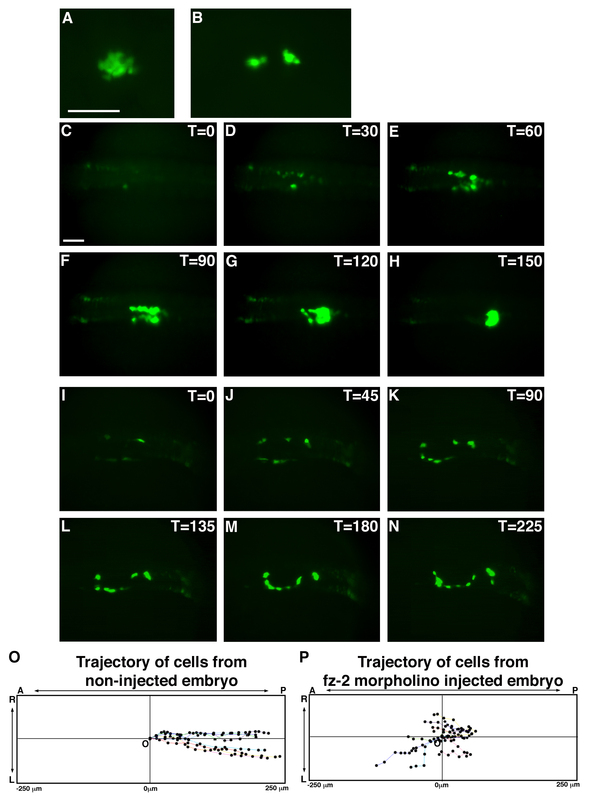 Injection of fz-2 MOs  into transgenic zebrafish embryos ('morphants') carrying the GFP reporter gene under the control of the insulin promotor (insulin:GFP transgenic fish: ) resulted in scattered GFP-positive cells compared to the single islet observed in wild-type (WT) embryos (Fig. 1A,B). To determine the cause of abnormal insulin expression in FZ-2 morphants, we conducted a time-lapse imaging analysis. In wild-type embryos, bilateral insulin-positive cells first appeared at approximately the 14-somite stage. These cells divided and actively migrated to the posterior. As insulin-positive cells migrate, these cells converge in the midline. By the 24 hours-post-fertilization (hpf) stage, all insulin-positive cells associate to form a single islet at the midline (Fig. 1C–H [also see additional file 1]). We have also performed a time-lapse analysis on insulin:GFP transgenic embryos injected with rhodamine-conjugated dextran (Molecular Probe, D-1841). This created embryos with GFP expression in the insulin-positive cells and rhodamine localized to random cells in a mosaic pattern. We found that the GFP-negative cells labeled with rhodamine did not change their relative positions and did not show any morphological changes associated with migrating cells, while GFP-positive cells moved posteriorly and medially, arguing that the GFP positive cells move relative to their neighboring cells [see additional file 2]. Plotting the trajectory of GFP-positive cells demonstrated that the pattern of cell migration is mostly along a straight line from the initial to the final position (Fig. 1O). The average migration rate of a GFP positive cell was 0.3 ± 0.12 μm/minute and average A-P progression was 0.3 ± 0.04 μm/minute (n = 10). Time-lapse imaging of insulin:GFP transgenic embryos shows cell migration defects in Fz-2 morphants. (A, C-H) Uninjected insulin:GFP transgenic embryo, (B, I-N) fz-2 MO-injected insulin:GFP transgenic embryo. All panels are dorsal views and anterior is to the left. Scale bar represents 100 μm. (A) Uninjected transgenic embryo, 24 hpf. (B) Fz-2 MO-injected transgenic embryo, 24 hpf. (C) At the 14-somite stage, bilateral patches of GFP-positive cells are visible in uninjected embryo. (D) At the 15–16 somite stage, GFP-positive cells have started proliferating. (E-G) At the 17 somite to 24 hpf stages, GFP-positive cells are aligned in bilateral rows of cells and undergo a medial and posterior migration. (H) At 24 hpf, all GFP-positive cells have merged to form one islet. (I) At the 14-somite stage, bilateral patches of GFP expression are apparent in fz-2 MO-injected embryos similar to uninjected embryos. (J-M) GFP-positive cells migrate in random directions in fz-2 morphant embryos. (N) At 24 hpf, GFP-positive cells have still not merged. (O) Trajectory of GFP-positive cells in uninjected insulin:GFP embryo. Notice that cells are uniformly moving posteriorly. (P) Trajectory of GFP-positive cells in fz-2 MO-injected insulin:GFP embryo. Notice cells are moving in random directions. A: anterior, P: posterior, T: time, L: left, R: right, O: origin. In transgenic insulin:GFP zebrafish embryos injected with fz-2 MO, bilateral insulin-positive cells also appeared at the 14-somite stage, as observed in uninjected transgenic embryos. However, these cells failed to migrate to the posterior. At 24 hpf, insulin-positive cells remained scattered in fz-2 morphants (Fig. 1I–N [also see additional file 3]). 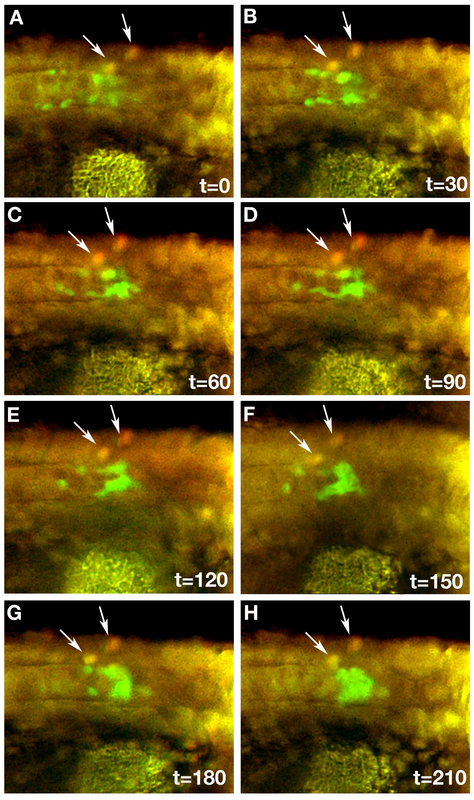 The average migration rate of a GFP-positive cell was 0.3 ± 0.08 μm/minute, similar to uninjected transgenic embryos, indicating that the GFP-positive cells are capable of moving at the normal speed. However, the trajectory of insulin-positive cells in fz-2 MO-injected embryos showed that the cells were moving randomly (Fig. 1P). The average A-P progression of an insulin-expressing cell in fz-2 morphant embryos was -0.02 ± 0.07 μm/minute (n = 10). These data argue that GFP-positive cells still can move normally but have lost directional information in fz-2 MO-injected transgenic embryos. As we reported earlier, fz-2 is restricted to somitic mesoderm and posterior paraxial mesoderm starting at the one somite stage. This expression pattern remains similar during somitogenesis, although the expression level of fz-2 in somitic mesoderm gradually decreases after 12–14 somite stage. (Fig. 2A, ). Double in situ hybridization of insulin and fz-2 and subsequent sectioning of the embryo showed that fz-2 expression is concentrated on the surface of somatic mesoderm and the entire endoderm adjacent to insulin-expressing cells (Fig. 2A,B). To determine if fz-2 is expressed in the insulin-positive cells, we sorted GFP-positive and -negative cells from the 20 somite stage insulin:GFP trangenic zebrafish embryos using Fluorescent Automated Cell Sorting (FACS), isolated total RNA from each sample, synthesized cDNA, and performed RT-PCR analysis for the presence of fz-2 transcript in the GFP-positive cells. As expected, EF-1α, a positive control, but not insulin was detected in the GFP-negative cells (Fig. 2C). In contrast, both EF1-α and insulin transcripts were detected in GFP-positive sample (Fig. 2C) indicating that the cell sorting procedure was effective. Two different sets of primers designed to amplify fz-2 transcripts produced bands from the GFP-negative cells but not from the GFP-positive cells (Fig. 2C). Our analysis shows that even though fz-2 and insulin are expressed in neighboring cells as detected by in situ hybridization, they are not co-expressed in the same cells. Migration defects in Fz-2 morphant embryos can be rescued by synthetic fz-2 mRNA. (A) Double in situ hybridization with fz-2 and insulin at 20 somite stage of development. Arrow, insulin; arrowhead, fz-2 expression in the endoderm; dotted line, approximate position of the section in (B). (B) A section of double in situ hybridization with fz-2 and insulin. Fz-2 is expressed more strongly on the surface of mesoderm and entire endoderm. Arrow, insulin; arrowhead, fz-2 expression in the endoderm; a, arteries; asterisk, neural tube; d, pronephric duct. (C) RT-PCR using cDNA made from sorted cells of transgenic insulin:GFP zebrafish embryos. L: ladder; lanes 1–5: GFP-negative cells; lanes 6–10: GFP-positive cells; lanes 1, 6: EF1α lanes2, 7: insulin; lanes 3, 8: fz-2 primer set #1; lanes 4, 9: fz-2 primer set #2; lanes 5, 10: wnt-5. (D) High-dose injection of either fz-2 MO1 or MO2 resulted in scattered insulin expression, whereas low dose injection of either MO caused such defects in less than 10% of embryos. Co-injection of low dose fz-2 MO1 and MO2 resulted in synergistic increase of percentage of embryos with scattered insulin expression. (E) 80% of fz-2 MO-injected embryos displayed scattered insulin expression. Co-injection of fz-2 MO and fz-2 RNA reduced the percentage of embryos with abnormal insulin expression down to 45%. (F-I) In situ hybridization with insulin at 24 hpf stage, anterior is to the left, (F) fz-2 MO1-injected embryo, (G) fz-2 mismatch MO-injected embryo, (H) fz-2 RNA-injected embryo, (I) fz-2 MO- and fz-2 RNA-co-injected embryo. Notice the compact islet in this embryo that displays an undulated notochord. To confirm the identity of the scattered GFP-positive cells in fz-2 MO-injected insulin:GFP embryos, fz-2 morphant embryos were fixed at 24 hpf and analyzed for insulin expression by in situ hybridization. At 24 hpf, wild-type zebrafish embryos have a single islet consisting of 15–20 cells at the midline. In contrast, insulin-expressing cells in fz-2 morphant embryos were scattered along the A-P axis similar to the pattern of GFP-expressing cells in fz-2 MO-injected transgenic embryos (Fig. 2F). The number of insulin-positive cells in fz-2 morphants was not significantly different from control embryos despite the abnormal islet morphology, indicating that cell proliferation is not significantly affected (average: 12 ± 2 cells in wild-type and 10 ± 2 cells in MO-injected, n = 25 for each group). Injection of two different previously published MOs targeting non-overlapping 5' regions of fz-2 mRNA generated similar effects on insulin-expressing cell migration. Furthermore, co-injection of two fz-2 MOs resulted in a synergistic increase in a percentage of embryos with scattered insulin expression, suggesting a specific role of fz-2 in proper islet formation (Fig. 2D). To assess whether scattered insulin expression observed in fz-2 MO-injected embryos was specific to the loss of fz-2 function, we also injected a five-base mismatch fz-2 MO, which elicited no effect on insulin-expressing cell migration (Fig 2E,G). To test the specificity of the observed phenotype in fz-2 MO-injected embryos further, we examined the ability of synthetic fz-2 mRNA to reverse the observed defects in insulin-positive cell migration. The injected synthetic fz-2 mRNA contains a β-globin 5' leader sequence and does not contain the fz-2 MO target-site sequence. Injection of fz-2 MO resulted in 84% of the embryos (n = 77) with scattered insulin expression (Fig. 2E,F). None of the fz-2 mRNA-injected embryos (n = 81) displayed scattered insulin expression (Fig. 2E,H). In contrast, co-injection of fz-2 MO and fz-2 mRNA resulted in a significantly lower frequency of embryos (n = 112, p value = 0.001) with scattered insulin expression compared with embryos injected with fz-2 MO only (Fig. 2E,I). These results demonstrate that the scattered insulin expression observed in fz-2 morphant embryos is specific to the loss of fz-2 function. Because the Fz protein family can function as receptors of Wnt proteins, we wanted to test if any known Wnt protein is similarly required for insulin-positive cell migration. 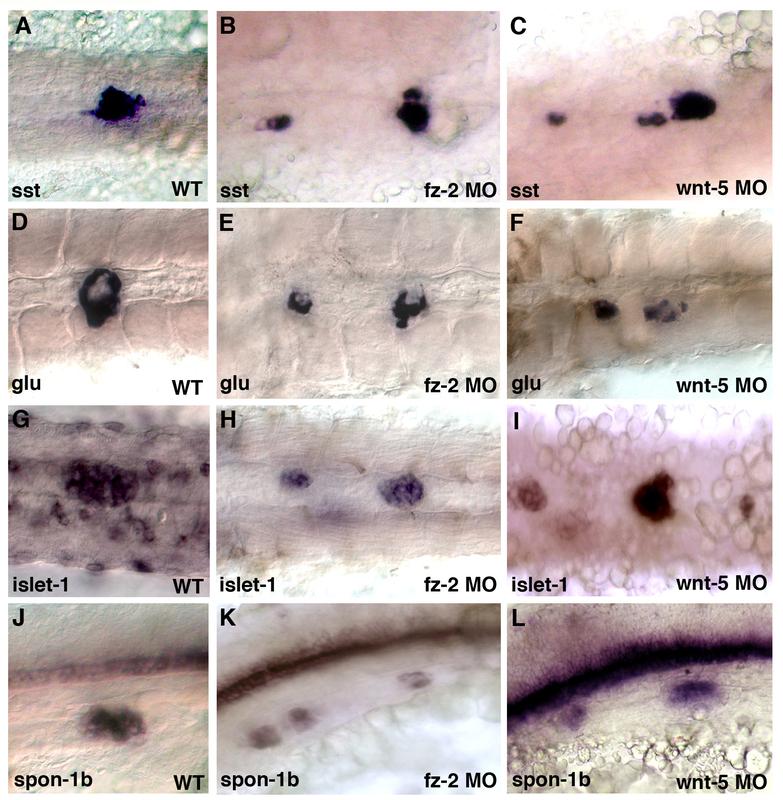 Loss-of-function of three Wnts – wnt-5, -8, and -11 – are each reported to cause developmental abnormalities grossly similar to the ones observed in fz-2 morphants [16, 17]. Among these, wnt-5 exhibits the most similar expression pattern to fz-2 during somitogenesis. 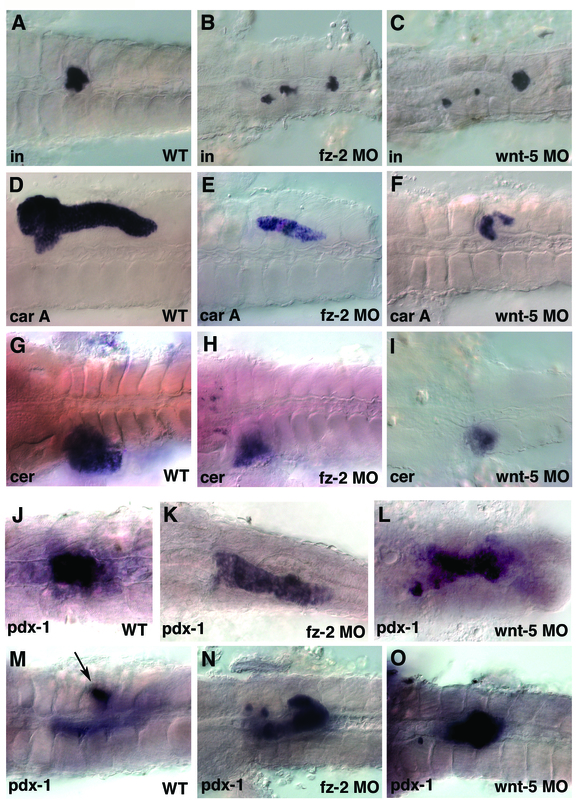 Zebrafish wnt-5 is weakly expressed in the posterior half of the somitic and lateral mesoderm and strongly in the tail bud during somitogenesis . Interestingly, double in situ hybridization against wnt-5 and pdx-1 revealed that wnt-5 is expressed as a gradient of RNA from the posterior limit of pdx-1 expression to the tail-bud at the 10-somite stage when pdx-1 is first detected (Fig. 3A). However, we did not detect wnt-5 in the GFP-positive cells isolated from insulin:GFP transgenic zebrafish embryos indicating that wnt-5 is not co-expressed with insulin (Fig. 2C, lane 10: compare to wnt-5 band from GFP-negative cells in lane 5). Wnt -5 has a specific role in islet formation. (A) Double in situ hybridization with pdx-1 and wnt-5, 10 som stage, dorsal view, the anterior is to the left. Arrow, pdx-1 expression, bracket, wnt-5 expression. (B-H) In situ hybridization with insulin at 24 hpf. (B) wild-type, (C) WNT-8 morphant embryos, (D) WNT-11 morphant embryos, (E) WNT-5 morphant embryos, (F)wnt-5 mismatch MO-injected embryos, (G) wnt-5 RNA injected embryo, (H) wnt-5 MO and wnt-5 RNA co-injected embryo. Notice the compact islet in this embryo that displays an undulated notochord. (I) Percentage of embryos with scattered insulin expression resulting from injection of wnt-5 MO reduced significantly from 60% to 10% when wnt-5 RNA was co-injected with wnt-5 MO. (J-L) Morphology at 24 hpf, (J) wild-type, (K) wnt-5 insertional mutant, (L) wnt-5 translation-blocking MO-injected embryos. Notice that wnt-5 MO injected embryos have more severe morphological phenotype than wnt-5 insertional mutant embryos. 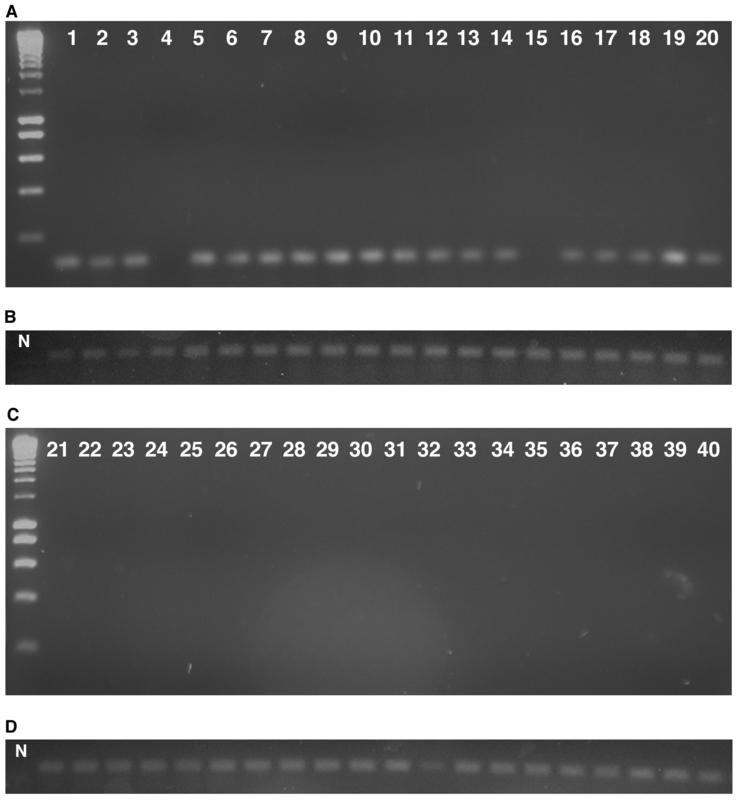 (M) RT-PCR analysis of wnt-5 transcript in wnt-5 exon-intron MO injected embryos. Injection of wnt-5 exon-intron MO results in severely shortened wnt-5 transcript. L:ladder, 1:EF-1α control, 2:wnt-5. To identify a candidate Wnt ligand, we utilized injections of MOs against wnt-5, -8, and -11 that effectively generate mutant phenocopies [17, 19]. We generated Wnt-5, -8, and -11 morphants as described and analyzed insulin expression by in situ hybridization at 24 hpf [17, 19]. Islet formation was normal in Wnt-8 and -11 morphant embryos as analyzed for the expression of insulin, pdx-1, glucagon and somatostatin (Fig. 3B–D, data not shown). In contrast, analysis of insulin expression at 24 hpf of Wnt-5 morphant embryos revealed scattered insulin expression along the A-P axis, similar to the islet phenotype noted in fz-2 morphant embryos (Fig. 3E). To address the specificity of wnt-5 function in pancreatic islet formation, we designed a second MO targeting the 3' splice-site of exon 3. Injection of this MO resulted in effective skipping of exons 2 and 3, leading to a transcript that is only about 200 bp in length (Fig. 3M). When we injected this MO, embryos showed scattered insulin expression similar to embryos injected with wnt-5 translation blocking MO (Fig. 3I), arguing that the zygotic function of wnt-5 is involved in insulin-positive cell migration. In addition, injection of a five-base-mismatch wnt-5 MO resulted in embryos with normal insulin expression (Fig. 3F,I). Furthermore, the observed scattered insulin expression pattern in Wnt-5 morphant embryos was ameliorated by the addition of wnt-5* mRNA that encodes an altered wnt5 open reading frame engineered with degenerate nucleotides in the region around the translation start site to avoid targeting by the wnt-5 MO (see Methods). When translation blocking wnt-5 MO was injected alone, 65% of embryos (n = 75) showed scattered insulin expression (Fig. 3E,I). Embryos injected with wnt-5* mRNA alone resulted in 94% of embryos (n = 55) with normal insulin expression (Fig. 3G,I). The percentage of embryos with abnormal insulin expression decreased to 12% (n = 53, p value = 0.003) when embryos were co-injected with wnt-5* mRNA (Fig. 3H,I). We also analyzed insulin expression in two different published wnt-5 mutant alleles (alleles of the mutant locus pipetail; kind gifts of Dr. M. Hammerschmidt (ppt ti265)  and Dr. N. Hopkins(ppt hi1780b ) ). In situ analysis using the insulin marker did not detect any significant effect on pancreas development in embryos homozygous for either of the tested pipetail alleles (data not shown). Gross morphological examination of embryos from either pipetail allele demonstrated a significant inter-embryo variation in manifestation of the pipetail embryonic phenotype, with the insertional allele (ppt hi1780b ) exhibiting an overall more severe phenotype. The ppt hi1780b allele showed phenotypes that were less extreme than the effects noted for the wnt-5 morphants (Fig. 3J–L). To investigate further whether the scattered insulin expression observed in WNT-5 morphant embryos is specific to the loss of WNT-5 function, we tested to see if carriers of the ppt hi1780b allele are more sensitive to wnt-5 MO injection (Table 1). Injecting 2 ng of either translation-blocking or exon-intron junction targeting wnt-5 morpholinos in wild-type embryos resulted in less than 5% of embryos with scattered insulin expression. We injected the same low dose wnt-5 MOs into embryos obtained from a cross between wnt-5 ppt hi1780b allele carrier and wild-type adult fish. In this batch of embryos, approximately 50% are expected to be carriers of the ppt hi1780b allele. This study resulted in approximately 50% of embryos exhibiting scattered insulin expression (Table 1). Furthermore, genotyping of individual embryo showed that 90% of embryos with abnormal insulin expression were ppt hi1780b carriers (n = 20) whereas 100% with normal insulin expression were wild-type (n = 20), arguing that carriers of the ppt hi1780b allele are more sensitive to wnt-5 MO injection [see additional file 4]. These data argue that the observed wnt-5 MO phenotype is specific to the targeting of the wnt-5 gene and that zygotic wnt-5 function is required for normal pancreatic islet formation. Wnt-5 heterozygous embryos are more sensitive to wnt-5 MO injection in pancreatic islet formation. 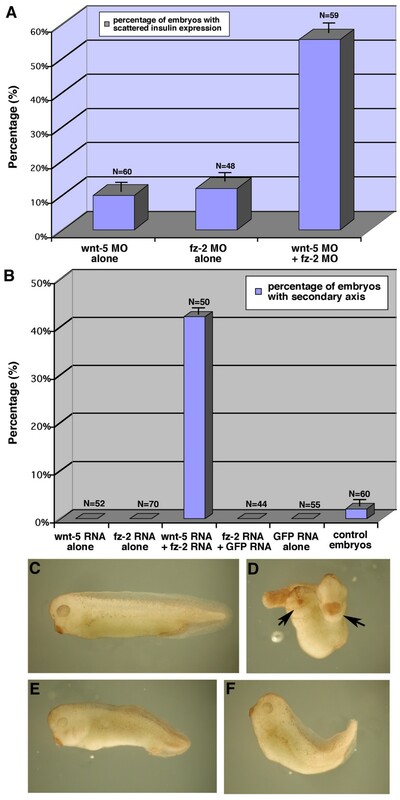 2 ng of either wnt-5 translation-blocking or exon-intron junction targeting morpholinos were injected into either wild-type embryos or embryos generated from an outcross of a wnt-5 mutant carrier adult. In wild-type embryos, injection of either wnt-5 MO resulted in less than 5% of embryos with scattered insulin expression. However, injection of either wnt-5 MO resulted in about 50% of embryos with scattered insulin expression in embryos obtained from the wnt-5 mutant carrier outcross. To determine which step of pancreatic development is perturbed, we analyzed the expression patterns of different markers in fz-2 and wnt-5 morphant embryos. We examined early endodermal markers, mixer at 50% epiboly stage and sox-17 at 90% epiboly stage in fz-2 and wnt-5 morphant embryos, and found that the expression of mixer and sox-17 were normal in those embryos (Fig. 4A–C, 4D–F). We also examined the anterior endoderm marker, fox-A2, and the posterior endoderm marker, gata-6, at 24 hpf in wild-type, fz-2 and wnt-5 morphant embryos. Expression of fox-A2 and gata-6 was normal in both fz-2 and wnt-5 morphant embryos (Fig. 4G–I, 4J–L). These results indicate that the abnormal insulin expression observed in both fz-2 and wnt-5 morphant embryos is not due to secondary defects because of abnormal endoderm specification or migration. Early endoderm markers are not affected in Wnt-5 and Fz-2 morphant embryos. All pictures are dorsal views. (A, D, G, J, M) wild-type, (B, E, H, K, N) Fz-2 morphants, (C, F, I, L, O) Wnt-5 morphants. (A-C) mixer, 50% epiboly, (D-F) sox-17, 90% epiboly, (G-I) fox-A3, 24 hpf, (J-L) anterior endoderm expression of fox-A3, arrow, pancreatic endoderm, 24 hpf, (M-O) gata-6, 24 hpf. Scale bar = 300 μm. At 24 hpf, somatostatin, a marker for mature pancreatic δ-cells, was scattered similarly to insulin in both fz-2 and wnt-5 morphant embryos (Fig. 5A–C). Glucagon, which is expressed in pancreatic endocrine α-cells, was scattered along the A-P axis but still expressed at the edge of the islet in both fz-2 and wnt-5 morphants (Fig. 5D–F). Other endocrine pancreas markers, islet-1 and fspondin-2b, were also scattered along the A-P axis (Fig. 5G–I, 5J–L). Wnt-5 and Fz-2 morphant embryos exhibit similar pancreatic islet defects at 24 hpf. In all panels, anterior is to the left and 24 hpf. .A-I, dorsal view; J-L, lateral view. (A, D, G, J) Wild-type embryos. (B, E, H, K) Fz-2 morphants. (C, F, I, L) Wnt-5 morphants. In situ hybridization analysis of (A, B, C) somatostatin, (D, E, F) glucagon, notice a hollow spot in the middle of each patch, (G, H, I) islet-1, (J, K, L) fspondin-2b. Note scattered pancreatic cells in Fz-2 and Wnt-5 morphants. At the 3dpf stage, insulin-positive cells remain scattered in both wnt-5 and fz-2 morphants (Fig. 6A–C). Expression of an exocrine pancreas marker, carboxypeptidase-A, and a liver marker, ceruloplasmin, was reduced in both fz-2 and wnt-5 morphant embryos (Fig. 5D–I respectively). The hollow spot indicating the position of the islet within the exocrine pancreas was not observed in either wnt-5 or fz-2 morphants (Fig. 5D–F). This indicates that pancreatic islets in wnt-5 and fz-2 morphants are not completely embedded within exocrine tissue as found in wild-type embryos. However, scattered insulin expression is not likely to be affected by the reduction of the exocrine pancreas, because the exocrine pancreas in zebrafish does not develop until after the completion of insulin-positive cell migration. Our results suggest that fz-2 and wnt-5 have similar function in pancreatic islet development. Interestingly, examination of the transcription factor pdx-1 expression profile revealed an unexpected phenotype in these embryos. Pdx-1 is one of the earliest known markers for the entire pancreas and is important for both early pancreatic development and adult β-cell function . The area of pdx-1 expression was expanded in both fz-2 and wnt-5 morphants as analyzed by in situ hybridization at 24 hpf (Fig. 6J–L). At 3dpf, pdx-1 expression is restricted to the pancreatic islet, duct, and part of the intestine (Fig. 6M). Pdx-1-expressing cells in fz-2 and wnt-5 morphant embryos remain scattered and do not coalesce into a single islet until 3dpf (Fig. 6K,L) similar to insulin-expressing cells. In addition, the area of pdx-1 expression in the intestine becomes reduced in fz-2 and wnt-5 morphant embryos compared to wild-type embryos at 3dpf (Fig. 6M–O). The expanded pdx-1 expression at 24 hpf and misexpression at 3dpf in fz-2 and wnt-5 morphants requires further study (see discussion). Wnt-5 and Fz-2 morphant embryos have other similar defects. In all panels, view is dorsal, anterior is to the left. (A-I, M-O) 3dpf, (J-L) 24 hpf stage. (A, D, G, J, M) Wild-type embryos. (B, E, H, K, N) Fz-2 morphants. (C, F, I, L, O) Wnt-5 morphants. In situ hybridization analysis of (A-C) insulin, (D-F) carboxypeptidase A, notice the hollow spot indicating the position of the islet, (G-I) ceruloplasmin, (J-O) pdx-1, (M) arrow, pdx-1-staining in islet. We next determined if wnt-5 and fz-2 could interact genetically. First, we co-injected low doses of wnt-5 and fz-2 MOs. If wnt-5 and fz-2 were in two independent signaling pathways, co-injection of MOs against these genes would result in an additive increase of embryos with abnormal insulin expression. In contrast, a synergistic increase of embryos with abnormal insulin expression would indicate that wnt-5 and fz-2 are either in the same signaling pathway or in two pathways that can interact in the normal insulin-positive cell migration process. Injection of a low dose of wnt-5 MO resulted in 10% of embryos (n = 60) with abnormal insulin expression. Injection of a low dose of fz-2 MOs resulted in 12% of embryos (n = 48) with abnormal insulin expression. When we co-injected wnt-5 MO and fz-2 MOs, 55% of embryos (n = 59) displayed abnormal insulin expression, a synergistic increase in the percentage of embryos with abnormal insulin expression (Fig. 7A). This result suggests that wnt-5 and fz-2 can interact genetically in the same signaling pathway during islet formation. Wnt -5 and fz -2 are in the same signaling pathway. (A) Injection of either wnt-5 MO or fz-2 MO mix results in less than 10% of embryos with scattered insulin expression. Co-injection of wnt-5 and fz-2 MOs results in 50% of embryos with defects. (B) Injection of either wnt-5 mRNA or fz-2 mRNA did not cause secondary axis in Xenopus embryos, whereas co-injection with both mRNAs resulted in 40% of embryos with secondary axis. Control injections of GFP mRNA alone or together with fz-2 mRNA resulted in no embryos with secondary axis. 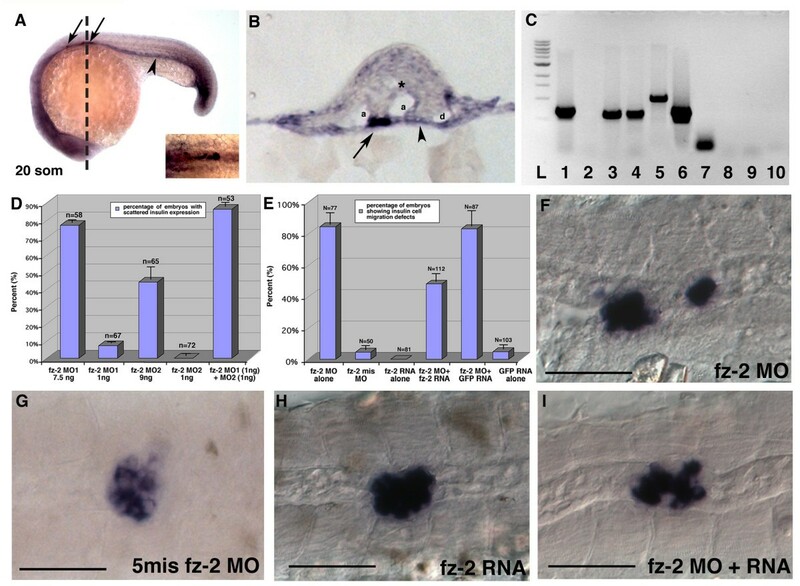 (C-F) Xenopus embryos, tailbud stage, (C) wild-type, (D) wnt-5 and fz-2 mRNA co-injected, black arrows-point to the primary and secondary hatching glands, (E) wnt-5 mRNA injected, (F) fz-2 mRNA injected. To test a possible direct interaction between zebrafish wnt-5 and fz-2 further, we used a Xenopus secondary axis induction assay . In this system, a Fz-dependent induction of the secondary axis in Xenopus has been shown to be the result of direct receptor (Fz) activation by the Wnt ligand. This effect can be mediated by Wnt ligands and Fz receptors that normally function via either canonical or non-canonical signaling processes. In this experiment, we injected either wnt-5 mRNA or fz-2 mRNA into two ventral blastomeres of 4-cell stage Xenopus embryos. Injecting zebrafish wnt-5 RNA or fz-2 RNA elicited a shortened and mildly bent body at the tailbud stage without the induction of any secondary axes (Fig. 7B,E,F). When we co-injected both RNAs in Xenopus embryos, more than 50% of embryos showed a secondary axis at the tailbud stage (Fig. 7B,D). This suggests that zebrafish Wnt-5 and Fz-2 proteins can interact functionally and signal when placed in an appropriate cellular environment. To determine if wnt-5 acts genetically upstream of fz-2, we removed Wnt-5 protein by injecting wnt-5 MO and assayed whether fz-2 mRNA can rescue the resulting migration defects. When wnt-5 MO was injected alone, 56% of injected embryos (n = 42) showed scattered insulin expression (Fig. 8A,B). Injection of fz-2 RNA alone did not cause significant abnormalities in insulin expression (3% of embryos, Fig. 8A,C). The percentage of embryos with scattered insulin expression significantly decreased to 20% (n = 50, p value = 0.019) when fz-2 RNA was co-injected with wnt-5 MO (Fig. 8A,D). In a control experiment, co-injection of wnt-5 MO and GFP RNA did not reduce the percentage of embryos with abnormal insulin expression (Fig. 8A). Wnt -5 acts genetically upstream of fz -2. (A) Injection of wnt-5 MO alone results in 50% embryos with insulin cell defect. Injection of fz-2 mRNA results in 5% embryos with insulin cell defects. Co-injection of wnt-5 MO and fz-2 mRNA results in 20% of embryos with abnormal insulin expression. In a control experiment, co-injection of wnt-5 MO and GFP mRNA results in 45% of embryos with defects. (B-D) Insulin expression as analyzed by in situ hybridization at 24 hpf, (B) wnt-5 MO injected, (C) fz-2 RNA injected, (D) wnt-5 MO- and fz-2 RNA-injected embryos. Note that fz-2 mRNA rescues insulin cell migration defect in wnt-5 morphants. (E) Same dose of wnt-5 mRNA that can rescue the insulin cell migration defects in wnt-5 morphants cannot rescue the defects in fz-2 morphants. In contrast, injection of wnt-5 RNA cannot ameliorate defects in fz-2 morphant embryos (Fig. 8E). Injecting fz-2 MO resulted in 80% of embryos (n = 106) with scattered insulin expression. Injecting wnt-5 RNA caused 5% of embryos (n = 42) with scattered insulin expression. Co-injection of fz-2 MO and wnt-5 RNA resulted in 88% of embryos (n = 84) with scattered insulin expression. These results demonstrate that fz-2 RNA can rescue abnormal islet morphology caused by the wnt-5 MO, whereas wnt-5 RNA cannot rescue abnormal islet morphology caused by fz-2 MO, placing fz-2 genetically downstream of wnt-5 in this process. To test if the role of Wnt-5 signaling in pancreatic development is conserved between different vertebrates, we obtained mice heterozygous for a previously described Wnt5a null allele . Wild type and Wnt5a -/- embryos were harvested at E16.5, E17.5 and E18.5 and examined for defects in pancreatic development. Although Wnt5a -/- embryos have defects in many structures, the size and macroscopic morphology of the pancreas were normal with a characteristic loose lobular appearance and normal anatomical positioning: with the head of the pancreas located at the curve of the duodenum, the body associated with the greater omentum at the ventro-posterior surface of the stomach, and the narrower tail region pointed towards the hilum of the spleen (data not shown). We next performed immunohistochemical analysis of consecutive pancreatic sections with antibodies against insulin and glucagon between E16.5, E 17.5 and E18.5. In both wild type and mutant pancreata at E16.5, insulin-positive cells were intermingled with glucagon-positive cells as described previously  and did not have a typical mature distribution with insulin cells located centrally and glucagon cells located peripherally (Fig. 9A–D). At E17.5, insulin-staining cells were becoming more compact and glucagon-staining cells began to assume a peripheral distribution in both wild type and mutant mice (Fig. 9E–H). Since this distinct cell architecture is not observed in wild type mice before E17.5 [4, 25], the appearance of the peripheral distribution of glucagon-positive cells in the mutant islets at E17.5 argues against maturational delay. Similar pattern was observed in the islets at E18.5 with insulin-producing β-cells in the center of the islet (Fig. 9I,K) and the glucagon-producing α-cells on the periphery of the islet (Fig. 9J,L). However, when compared to compact and round islets in wild type embryos, the mutant islets were streaked along the pancreatic ducts (Fig. 10C), similar to mice lacking EGF receptor . This phenotype is also very similar to that of zebrafish wnt-5 and fz-2 morphants, in which glucagon positive cells are scattered along the A-P axis while positioned at the periphery of insulin-positive cells (Fig. 5E,F). Pancreatic islet development in Wnt5a -/- mouse embryos is not delayed. (A-D) E16.5, (E-H) E17.5, (I-L) E18.5, (A, C, E, G, I, K) insulin antibody staining, (B, D, F, H, J, L) glucagon antibody staining, (A, B, E, F, I, J) pancreas tissue from wild-type siblings, (C, D, G, H, K, L) pancreas tissue from Wnt5a -/- mouse embryos. Notice that glucagon staining is round and spherical at E16.5, but positioned at the periphery of insulin cells at E17.5 and E8.5. Wnt5a -/- islets remain in ductal proximity and have a streaked appearance at E18.5. (A) In Wnt5a -/- embryos, most islets are associated with ducts. Both small and large β-cell aggregates are more frequently associated with pancreatic ducts in Wnt5a -/- embryos at E18.5 than in wild-type embryos. (B, C) Insulin antibody staining. (B) Round and compact islets in wild-type embryos. A normal pancreas consists of islets that are associated and separated from ducts. Arrows: pancreatic duct, asterisk: an islet separated from duct. (C) Streak-like, fragmented islets in Wnt5a -/- mutant embryos. To examine whether defects in endocrine cell migration during islet formation can cause streaked islets of Wnt5a -/- embryos we used a previously described morphometry method . Since insulin-positive cells have to detach and migrate away from the pancreatic ducts to form mature islets, one of the measures of islet cell migration is the degree to which insulin-positive cells remain in direct contact with the ductal epithelium. To assess migration of the endocrine cells in Wnt5a null embryos, we concentrated our analysis at E18.5, the latest time point at which we can assess separation of insulin positive cells from the ducts. 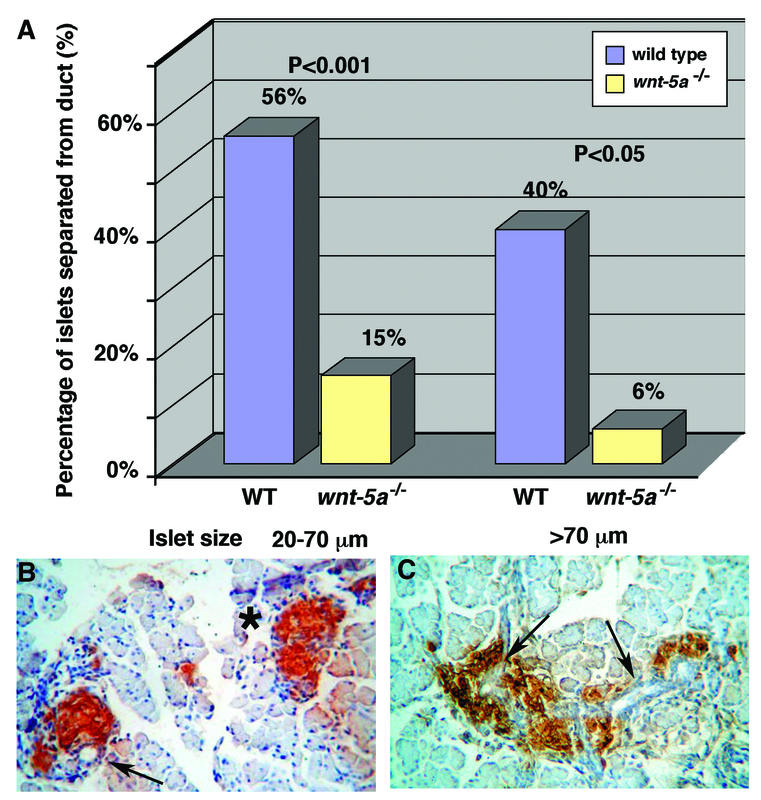 Lethality at birth of Wnt5a knockout mice prohibits later analysis of pancreas development in these mice. When compared to wild-type embryos, the number of islets separated from the ducts was greatly reduced in the pancreata of Wnt5a -/-embryos (Fig. 10A). Only 15% of small islets and 6% of larger islets were separated from the ducts in the mutants, compared to 56% (P < 0.001) and 40% (P < 0.05) respectively in the wild type mice (Fig. 10B,C). Our results implicate that Wnt5a signaling is also important in the insulin-positive cell migration process during morphogenesis of the pancreas in higher vertebrates. The function of a wnt-5/fz-2 pathway in insulin-positive cell migration is most likely to provide the right environment and/or signals for insulin-positive cell migration during islet formation. Our time-lapse analysis of fz-2 MO-injected transgenic embryos shows that the insulin-positive cells still migrate, but their direction of migration is random indicating these cells have lost key positional information in the absence of the wnt5/fz2 signal (Fig. 1). In addition, our cell sorting analysis shows that wnt-5 RNA is expressed in a posterior-anterior gradient, potentially serving as a key step in establishing the positional information required by these migrating cells. Analysis of the receptor, fz-2, however, reveals a further complexity. Fz-2 RNA is detected in the cells immediately adjacent to the mis-migrating insulin-positive cells, suggesting that the function of wnt-5/fz-2 pathway activation in islet cell formation is a cell-non-autonomous and/or cell-cell instructive function in the transmission of this positional information (Fig. 2B). Interestingly, non-autonomous fz-mediated signaling has been observed during Drosophila development , but this process of information exchange does not require any cell migration movements or, apparently, any wnt ligand . Further study is required to determine how the wnt-5/fz-2 signaling produces the right environment that allows normal insulin-positive cell migration during islet formation. The activation of Wnt-5 signaling can change intracellular Ca2+ concentration . One hypothesized function of the Wnt/Ca2+ pathway is to antagonize a second and simultaneously active Wnt/β-catenin pathway [27, 28]. Wnt/β-catenin signaling is known to specify cell fate directly . For example, reduction of maternal and zygotic wnt-5 activity using genetic approaches results in hyperdorsalized embryos . Further investigation is required to determine whether wnt-5/fz-2 signaling provides the right environment and/or signals for normal insulin-positive cell migration by antagonizing the Wnt/β-catenin pathway or by another novel mechanism. We observed an altered expression pattern of pdx-1 transcript in both wnt-5 and fz-2 morphant embryos. In our time-lapse imaging analysis, however, we observed that the initial specification of insulin-expressing cells was normal, and we observed no ectopic insulin-positive cells in spite of expanded pdx-1 expression in fz-2 or wnt-5 morphant embryos. Furthermore, the number of insulin-expressing cells is not increased in either fz-2 or wnt-5 morphant embryos even though these embryos displayed two or more insulin expression domains, sometimes with single cell patches, as observed in our time-lapse imaging analyses. These data suggest that the scattered insulin-expression is not due to ectopic islet formation. Future work will be required to detail the role (if any) for this expanded pdx-1 expression in abnormal insulin-positive cell migration. Vertebrate pancreatic development is described here in one of its simplest forms in zebrafish (represented by a single islet at 24 hours of development) and by a more complex vertebrate system in mouse. Certain processes of pancreatic islet formation in zebrafish and mouse appear to be incongruent. For example, sonic hedgehog (shh), which is expressed in the entire endoderm except for the pancreatic endoderm, was shown to be a negative regulator of the adoption of pancreatic endoderm fate in mice [29, 30]. In zebrafish, however, shh and other hh proteins are not expressed in the endoderm . In addition, ectopic expression of shh induces a pancreatic cell fate rather than represses it, a result opposite to what was observed in mammalian models [31, 32]. Despite these differences, the initial specification of insulin-expressing cells occurs before an islet is formed in both animals, and these insulin-positive cells migrate and form an islet at a distance from where they are initially specified. Even though a comparable structure to a duct does not exist in zebrafish at the stage when islet formation occurs, previous studies in mouse and our time-lapse imaging analysis show that this migration process of islet formation is similarly required to form normal islets in both mouse and zebrafish. The final disorganized islet phenotypes were observed as a result of abnormal migration of insulin-positive cells in both zebrafish and mouse embryos with disrupted Wnt5 signaling. These results argue that Wnt5 signaling is required in pancreatic islet formation of both mouse and zebrafish, a role most likely shared throughout the vertebrate lineage. Our results suggest that wnt-5 is upstream of fz-2 in the same genetic pathway and show that Fz-2 functions as a receptor for Wnt-5 when placed in the right environment, as assayed using the Xenopus secondary axis assay system. In mouse, fz-2 and wnt-5 transcripts are expressed at the highest level among different wnts and fzs in the developing mouse pancreas, providing evidence that wnt-5 and fz-2 are expressed at the right place and time to be involved in islet formation as a functional ligand and receptor pair . 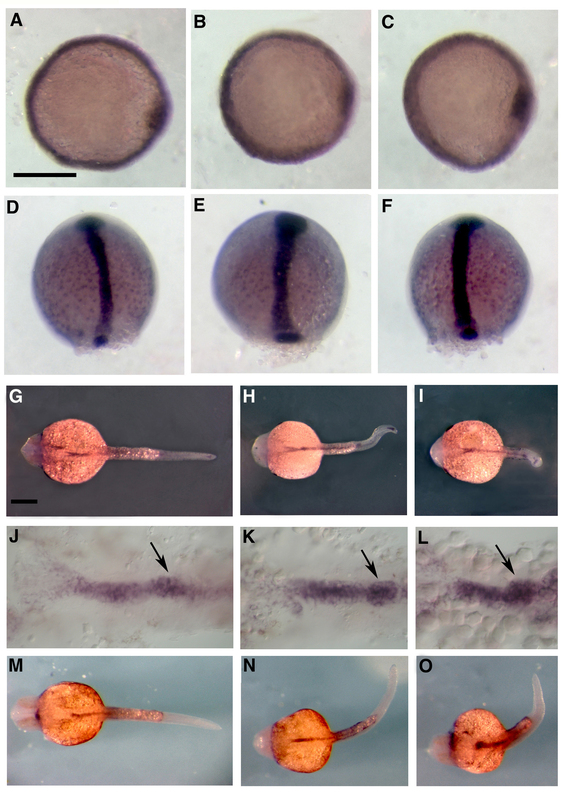 In zebrafish, early fz-2 expression is observed during somitogenesis. This expression pattern coincides with the timing and location of insulin cell migration, indicating that fz-2 is expressed at the right time and place to be involved in normal insulin-positive cell migration in zebrafish. Although wnt-5, wnt-11 and wnt-8 are expressed at the 14-somite stage, only wnt-5 and wnt-11 transcripts are detected at the location close to the presumptive pancreatic endoderm marked by pdx-1. wnt-5 is not expressed in the endoderm, but it is expressed in adjacent mesoderm close to the posterior boundary of early pdx-1 expression. wnt-5 proteins may be secreted from the mesoderm and signal to adjacent endoderm. Furthermore, our data show that wnt-11 morphant embryos have a normal pancreatic islet formation, whereas wnt-5 morphant embryos have similar pancreatic islet formation defects as fz-2 morphant embryos placing wnt-5 as the best candidate ligand for fz-2 in pancreatic islet formation. In embryos with defects in body axis elongation, some significant secondary effects on other organizing centers may occur. For example, zebrafish wnt-5 , wnt-8 , wnt-11  and knypek  morphant or mutant embryos display undulating notochord, reduced body length and a number of other less apparent abnormalities. These defects could conceivably result in abnormal pancreatic islet formation. However, wnt-8 and wnt-11 morphant embryos display normal islet formation despite body elongation defects. This supports a specific role of Wnt-5 signaling in pancreatic islet formation that is not secondary to body elongation defects. In addition, injection of wnt-5 and fz-2 mRNA ameliorates the pancreatic islet formation defects in wnt-5 and fz-2 morphant embryos, respectively, but not the body elongation defects under the same conditions. These results strongly suggest that pancreatic islet formation is at least partially independent of the body axis elongation process. In addition, the initial specification of insulin-positive cells occurs at the right place and time in zebrafish embryos. The congregation of insulin-positive cells occurs normally, and glucagon cells surround the insulin-positive cells in mouse Wnt5a -/-knockout embryos and wnt-5 and fz-2 morphant zebrafish embryos. Finally, the development of a grossly normal pancreas in Wnt5a -/- mouse knockout embryos, and the subsequent defect in islet formation, emphasizes the possible function of Wnt5 signaling during later stages of pancreatic islet morphogenesis. We examined a role of Wnt-5 signaling in pancreatic islet morphogenesis in zebrafish and mouse embryos. Time-lapse imaging of insulin-positive cells using transgenic zebrafish embryos revealed that gradual formation of a single islet in zebrafish is a result of an active cell migration process. Here we demonstrate that wnt-5 and fz-2 morphant embryos display defects in insulin-positive cell migration providing evidence for a role of Wnt5 signaling in this process. Comparative analyses of pancreatic tissue from Wnt5a knockout mice show that endocrine cells are specified normally within the primitive pancreatic epithelium. However, these insulin-positive cells fail to migrate from the ducts and form fragmented islets around ducts with glucagon-expressing cells positioned at the periphery. This argues that Wnt5a is required for insulin-positive cell migration, but not local organization within a forming islet in both mouse and zebrafish. Taken together, these results provide evidence that wnt-5/fz-2 signaling is required for the migration of insulin-positive cells during pancreatic development, and that this function is conserved. This study will help us to understand better the role of Wnt signaling during vertebrate pancreatic development and broaden our understanding of a role of Wnt signaling in pancreatic diseases. Wnt signaling pathways have been implicated in the pathogenesis of cancer , regulation of adipogenesis and insulin secretion [36, 37]. Wnt5b, for example, has recently been identified as a candidate gene for conferring susceptibility to type 2 diabetes . Wnt5a may inhibit the canonical Wnt pathway by promoting β-catenin degradation . Interestingly, dysregulation of β-catenin has been identified in various forms of malignancy, including pancreatic tumors . Our study reports a new and conserved role of Wnt-5 signaling in pancreatic islet formation and provides an example of how Wnt signaling functions in organogenesis. Wnt-5 ORF cDNA was amplified from a gastrula stage library and subcloned into pT3TS . The modified wnt-5* construct was made using a degenerate 5' primer designed to have a mismatch with the published wnt-5 MO (5'-ATG GAC GTA CGT ATG AAT CAG GGT CAC CTA CTT CTG GCA G-3'). The degenerate PCR fragment was subsequently subcloned into pT3TS vector at SpeI site. To synthesize sense wnt-5 mRNA, the wnt-5-T3TS construct was digested with XbaI and transcribed using T3 mMessage mMachine kit (Ambion). Modified wnt-5 mRNA (4 pg) was injected for the wnt-5 rescue experiment. Fz-2 ORF cDNA was amplified from the gastrula library and subcloned into pT3TS. Fz-2 construct was cut with XbaI and transcribed with T3 mMessage mMachine kit (Ambion). For Xenopus assay, 500 pg of fz-2 mRNA was injected into two ventral blastomeres of 4-cell stage Xenopus embryos. For the fz-2 MO specificity experiment and wnt-5 and fz-2 epistasis experiment, 25 pg of fz-2 mRNA was injected. We injected 2.5 ng of the previously described wnt-5 MO for the wnt-5 and fz-2 genetic interaction experiment and 8 ng of the same wnt-5 MO for all other experiments . We also used 5 ng of wnt-5 MO (5'-TGTTTATTTCCTCACCATTCTTCCG-3') targeting the 3' end of the exon-intron junction of exon 3. As a control, 8 ng of a five-base mismatch wnt-5 MO (5'-GTCGTTGCTTCTTTCACACTTCCAT-3') was injected. For the analysis of different pancreatic markers, we injected 5 ng of fz-2 MO mix (2.5 ng of fz MO-1 and 2.5 ng of MO-2) as described . As a control, 5 ng of a five-base mismatch fz-2 morpholino (5'-CCTCCATAGTCACGATAAGTTCGGC-3') was injected. For the wnt-5/fz-2 genetic interaction experiment, we injected 2 ng of fz-2 MO mix (1 ng of fz-2 MO-1 and 1 ng of fz-2 MO-2). For the FZ-2 morphant rescue experiment, we used 2 ng fz-2 MO-1. We injected 2–4 ng of the previously described wnt-11 MO to generate WNT-11 morphant embryos . Two specific MOs targeting WNT-8 have been previously described [16, 19]. Embryos were injected with 1–8 ng of wnt-8 MO1, 1–5 ng of wnt-8 MO2 or 2 ng wnt-8 MO mix (1 ng of wnt-8 MO1 and 1 ng of wnt-8 MO2). All three groups of embryos were allowed to develop for 24 hours and subsequently analyzed for pancreatic markers. Microinjections were performed at the one-cell stage as described . Single color in situ hybridization was performed as described . Double color in situ hybridization was performed as described . Fz-2 antisense riboprobe was synthesized as described . To synthesize wnt-5 probe, wnt-5 ORF cDNA was sub-cloned into 4-TOPO vector (Invitrogen) and subsequently cut with NsiI and transcribed with T3 RNA polymerase. The following probes were used: pdx-1, insulin , glucagon, somatostatin , islet-1 , fspondin-2b , sox-17 , fox-A2 , gata-6 , mixer , ceruloplasmin  and carboxypeptidase A . The mixer probe construct was synthesized by sub-cloning a 1 kb PCR fragment into the 4-TOPO vector. To synthesize the probe, DNA was cut with NotI and transcribed with T3. The fox-A2 probe construct was synthesized by sub-cloning a 1 kb PCR fragment of fox-A2 into the 4-TOPO vector. To synthesize the probe, DNA was digested with NotI and transcribed with T3. The carboxypeptidase A probe construct was synthesized by subcloning a 500 bp PCR fragment into the TOPO vector. To synthesize the probe, DNA was digested with NotI and transcribed with T3. The gata-6 probe was synthesized by digesting an EST clone obtained from ZFIN (cb 603) with Sal1 and transcribing with SP6. Wild-type zebrafish wnt-5 mRNA (250 pg) and 500 ng of zebrafish fz-2 RNA was injected alone or in conjunction into the two ventral blastomeres of the 4-cell stage Xenopus embryos (total of 500 pg wnt-5 RNA and 1 ng of fz-2 RNA). As a control, 500 ng of GFP RNA was injected alone or together with fz-2 RNA. The injected embryos were scored for double axes at the tailbud stage. Injections were performed as described . The 14 somite stage embryos were dechorionated and embedded in 0.8% low melting point agarose with 0.05% 3-aminobenzoic acid ethyl ester in a home made holding chamber. To prevent drying, the embedded embryo was covered with mineral oil and then overlaid with a cover slip. The images were captured every minute for 4–6 hours using a digital camera (Hamamastu, C4742-95) attached to a compound microscope with automated base (Zeiss) and OpenLab program. Insulin:GFP transgenic zebrafish embryos at the 20 som stage were dechorionated and homogenized in cold 1X Danieau/ 15% fetal bovine serum (FBS) solution using a tissue grinder. Homogenized embryos were washed twice with cold 1X Dan/15% FBS and incubated in 1X Danieau/ 15% FBS containing 10 mg/ml collagenase/dispase (Roche, #10269638001), 10 mg/ml trypsin and 10 unit/ml DNase 1 at 30°C for one hour with gentle agitation. Dissociated cells were subsequently washed twice, filtered through a cell strainer and finally suspended in 1X Dan/15% FBS supplemented with 1 μg/ml DAPI (Roche, #10236276001: to label dead cells and other debris). Cells were sorted using a cell sorter (BD science), collected in 100% FBS, and processed for subsequent total RNA isolation using an RNAqueous-4PCR kit (Ambion, #1914). For subsequent RT-PCR, cDNA was synthesized using Powerscript Reverse Transcriptase (BD science, #8460). The following primers were used. EF1-a: TCACCCTGGGAGTGAAACAGC, ACTTGCAGGCGATGTGAGCAG, insulin: CCATATCCACCATTCCTCG, CGGAGAGCATTAAGGCCTG, fz-2 set#1: ATGCAGGCGAGTGGAAGTG, CTTATAGCTGAGGTAGGCTG, fz-2 set#2: TGGCGTCTGGACAGCATC, TCCTGGTCTGTGAAGAACAT, wnt-5: ATGGATGTGAGAATGAACCAA, CTACTTGCACACAAACTGGTC. Zebrafish embryos injected with low dose exon-intron blocking wnt-5 MO were raised up to 3 days. The heads of these embryos were excised and frozen in -80°C for further genotyping and the bodies were further processed for insulin expression using in situ hybridization. After the insulin expression pattern analysis, genomic DNA of 20 embryos with normal and abnormal insulin expression pattern was isolated from the frozen head tissue and genotyped as described . Genomic DNA was isolated from tails or yolk sacs by standard methods  and amplified by PCR using the following primers: W1 (5'-GAC TTC CTG GTG AGG GTG CGT G-3'), W2 (5'-GGA GAA TGG GCA CAC AGA ATC AAC-3'), and W3 (5'-GGG AGC CGG TTG GCG CTA CCG GTG G-3'). The PCR settings were: 30 cycles, 94°C for 30 seconds, 65°C for 30 seconds, 72°C for 1 minute. A 360 bp band identified a wild-type allele, while a 200 bp band identified the mutant allele. Embryos used in this study were obtained by intercrossing Wnt5 +/- mice . Plug date was considered E0.5. The wild type (N = 5) and Wnt5a -/- (N = 8) embryos were harvested between E16.5-E18.5. The pancreatic tissue was dissected from the embryos, fixed in 4% paraformaldehyde, washed in PBS, dehydrated through alcohols, embedded in paraffin and cut into 7–9 μm thick sections. Immunohistostaining to detect the islets of Langerhans was done using commercially available mouse monoclonal anti-insulin antibodies (SIGMA I-2018) for β-cells, and anti-glucagon (G-2654) antibodies for α-cells as previously described . The sections were rehydrated, incubated in methanol containing 1% H2O2, and washed in PBS. The sections were then incubated with primary antibodies (concentration 1:500) at 4°C overnight. After washing the slides in PBS, the sections were incubated with biotinylated mouse IgG at 1:500 (Vector Laboratories) at room temperature for one hour. In order to detect the staining, the slides were incubated in Vectastain reagent for 30 minutes, followed by the diaminobenzidine detection method. The slides were then background stained by dipping them in hematoxylin 2 for 5 seconds, washed and cover slipped. We defined small islets as insulin-positive aggregates 25–70 μm in diameter and large islets as aggregates greater than 70 μm in diameter. A total of 31 islets from 3 wild type embryos and 56 islets from 5 Wnt5a -/- embryos were counted and classified as being either associated with ductal tissue or not associated. Islets were defined as associated with ductal tissue if insulin-positive cells were in direct contact with duct epithelium . 16 WT and 38 knockout islets 20–70 μm in size, and 15 WT and 18 knockout islets over 70 μm in size, were counted and classified. The statistical significance between the groups was determined by the Student's T-test for zebrafish experiments and by a Chi-Square test for the mouse experiment. We thank A. McMahon for providing us with Wnt5a knockout mouse, M. Jarcho for technical assistance, and R. Sorenson for helpful discussions. This work was supported by NIH Medical Scientist Training Grant to HK (5 T32 GM08244-16), NIH grants to SCE (GM55877 and GM63904), NIH grants to SL, and Student Research Fellowship Award from the Lawson Wilkins Pediatric Endocrine Society to JRS. JRS is a recipient of The Howard Hughes Fellowship for Medical Students. SCE conceived and designed this study. HJK conducted zebrafish and Xenopus experiments, analyzed results and drafted the manuscript. SS made the initial observation of defects in pancreatic islets of fz-2 morphants. JRS and AP performed immunohistochemistry of pancreatic islets from wild-type and wnt-5a KO mice, and JJ analyzed the results. JRS conducted islet morphometric analyses. SCE, AP and SL supervised the study. SCE and AP edited the manuscript. All authors read and approved the final manuscript.